In 1996, Copeland initially made $210 per week while working for WWF without an official contract. The company also paid for his outstanding college debt, which was around $40,000. After a Grand Prix Wrestling tour in the summer of 1997, De Marco urged Copeland to go to Calgary, where Hart was informally training wrestlers while recovering from knee surgery. He spent his tour earnings on a plane ticket and landed with no money or place to stay. He called Johnny Smith, whom he would met twice, and Smith agreed to give him food and shelter. Smith also drove Copeland to and from the gym and Hart's house, where he trained alongside Ken Shamrock, Test, Mark Henry and Kurrgan. Copeland returned to the Maritimes for another Grand Prix tour before going back to Hart's house, bringing Christian with him. After this camp, Hart was impressed enough to put in a good word for both men at the WWF. Later in the year, he was placed in a storyline angle with The Hardy Boyz. Gangrel soon betrayed both Edge and Christian and formed The New Brood with their enemies, The Hardy Boyz. 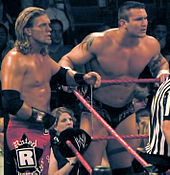 They feuded with the Hardy Boyz, as they went on to compete in a ladder match at No Mercy in October for the "managerial services" of Terri Runnels and $100,000, which the Hardy Boyz won. At Survivor Series, Edge and Christian and The Hardy Boyz faced Too Cool and The Hollys in a four-on-four Survivor Series elimination match where they lost. 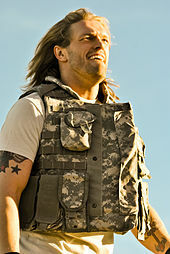 At Armageddon, Edge and Christian competed in an 8-team battle royal which was won by The Acolytes. 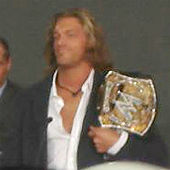 At Royal Rumble, Edge competed in the Royal Rumble match where he was eliminated by Al Snow and Val Venis. 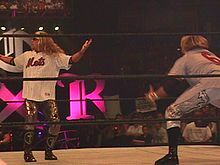 At No Way Out, Edge and Christian defeated The Hardy Boyz in a tag team match to determine the number one contenders to the WWF Tag Team Championship. At WrestleMania 2000 on April 2, Edge and Christian defeated the Hardy Boyz and the Dudley Boyz to win the WWF Tag Team Championship in a Triangle Ladder match, which ultimately led to the creation of the Tables, Ladders, and Chairs match. In March 2007, Copeland appeared alongside Randy Orton, John Cena, and Bobby Lashley on Deal or No Deal. Weeks later, he appeared on the sketch comedy show MADtv. He appeared in a Slim Jim commercial, in which his "spicy side" caused chaos in a DMV, a restaurant, and a hotel. Edge: a Decade of Decadence, a DVD documentary of Copeland's life, was released in December 2008. The DVD illustrates his wrestling career dating from when he entered the WWF to 2008. In 1998, Copeland began a relationship with Alannah Morley, the sister of Sean Morley (aka Val Venis), and they married on November 8, 2001. They divorced a few years later on March 10, 2004. His second marriage was to Lisa Ortiz on October 21, 2004. Soon after marrying his second wife, Copeland started an affair with Amy "Lita" Dumas, who was the girlfriend of Copeland's real life friend Matt Hardy at the time. The relationship between Copeland and Dumas became public knowledge in February 2005, resulting in Copeland's divorce from Ortiz on November 17, 2005. On December 12, 2013, Copeland and former WWE wrestler Beth Phoenix had a daughter, and named her Lyric Rose Copeland. On May 31, 2016, their second daughter was born; they named her Ruby Ever Copeland. Copeland and Phoenix married on October 30, 2016, which was Copeland's 43rd birthday. ^ Won during The Invasion storyline. 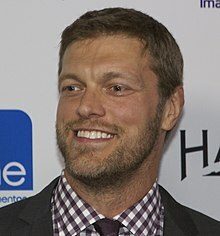 ^ "Edge Shoots on How Much WWE Paid Him & WWE paying $40,000 for his College". Edge: A Decade of Decadence DVD. World Wrestling Entertainment. 2008.